What to make of Turkey is arguably the most controversial issue in the Jihadi movement in Syria today. Is it to be seen as an infidel state? Is its leader, Recep Tayyip Erdogan, to be considered an apostate? Is collaboration with Turkey religiously legitimate? What should be the attitude to Erdogan’s victory in last week’s election? These are some of the questions that have bedeviled Hay’at Tahrir al-Sham (HTS), the Jihadi group previously affiliated with al-Qaida in an earlier incarnation, and have become the most serious source of division between the group and the al-Qaida loyalists organized in Tanzim Hurras al-Din. Previously, HTS appeared vehemently opposed to any relationship with the Turks, even criticizing groups like Ahrar al-Sham and Nour al-Deen al-Zinki for cooperating with Turkey on a diplomatic and military level. This was to change radically, however, when HTS openly assisted Turkish forces entering north-western Syria to set up military observation points as part of the Astana diplomatic process. The religious basis used by HTS to rationalize its “cooperation” with Turkey came from none other than Jihadi scholar Abu Qatada al-Filastini, who legitimized certain forms of interaction with the Turks in a fatwa issued as part of a Q&A session in October 2017. As pressure on HTS mounted in spring 2018, one of its senior shar’i figures, Abu al-Fatah al-Farghali, on 18 May affirmed that none of the group’s red lines regarding Turkey had been crossed. About two weeks later, however, Yousef al-Hajar, the head of HTS’s administration of political affairs, acknowledged in an interview with al-Jazeera that his organization in fact had a close relationship with Turkey, which he described as an “ally.” Al-Hajar had probably said too much, and a few days later the interview was removed by al-Jazeera while it continued to be heavily debated within Jihadi circles. On 8 June, as al-Qaida-aligned figures such as ‘Adnan Hadid began to question the group’s Jihadi bona fides, HTS felt it necessary to publish a statement on its continued commitment to jihad. The statement explained that the group’s strategy is a balancing act whereby it tries to order its priorities and neutralize its opponents without compromising its principles, which remain based on sharia. “Islamic politics is a part of jihad,” the statement read, and the group will act according to what benefits jihad insofar as this does not compromise sharia. With the Turkish presidential election last month, the intra-Jihadi debate escalated further. For several days following the announcement of Erdogan’s victory on 24 June, senior Jihadi figures engaged in a fierce debate over how close one could and shouldget to Turkey. The opening move was a statement shared by Abu Qatada on his Telegram channel on 24 June. In the statement, Abu Qatada calls Erdogan’s victory a “mercy” for the people of Turkey, not because he particularly likes Erdogan (in fact, in October 2017, he stated that he does not consider Erdogan a Muslim) but because he sees his competitors, “apostate unbelievers who hate the religion,” as worse. While acknowledging that Jihadi opinion is divided over Erdogan, Abu Qatada nonetheless takes obvious pleasure in his election: “I love his victory over his enemies—leftists, secularists, and nationalists who hate the religion.” Abu Qatada avers here that he is only pleased with Erdogan’s victory, not with Erdogan himself (“the man does not represent me”), but this qualification did not satisfy some Jihadis. Compared with his close friend and fellow Jihadi ideologue Abu Muhammad al-Maqdisi, Abu Qatada has taken a much more diplomatic approach to the last year’s Jihadi infighting, including on the issue of collaborating with Turkey. It was therefore little surprise that Maqdisi, just a little later the same day, published his own take on the Turkish election that was in stark contrast to Abu Qatada’s celebratory words. Following the traditional method of framing his remarks in response to questions posed to him, Maqdisi recounts (here and here) how a person asked him, “Should we elect for Erdogan?” Referring to himself, he answers, “Are you asking the one who people call the sheikh of tawhid, who has dedicated his life to supporting it and giving it priority over everything … are you asking him about electing a person who rules only by secularism?” The questioner then asks Maqdisi, “So are we supposed to let the one with greater enmity towards Islam win? !” For Abu Qatada, this was the crux of the matter: had Erdogan not won, somebody more opposed to Islam would. But for Maqdisi, this is not a legitimate concern. The muwahhideen (believers in monotheism) should not be concerned with choosing between the one with greater enmity towards Islam and the one with less enmity. They should simply be advocating and upholding tawhid (monotheism). To better understand these differences between the Jihadi ideologues, I posed a question to Maqdisi myself, asking him how he views the disagreement. “Fools are those who build their homes on sand,” he replied. “I do not join them in celebrating his [Erdogan’s] victory.” However, he was careful not to attack anyone specifically for applauding Erdogan. Regarding the narrower question whether it is permissible to “rejoice” in his victory (as the early Muslims allegedly rejoiced in the victory of the Byzantines over the Persians), Maqdisi is more lenient, saying that it is fine. Yet rejoicing in Erdogan’s victory is different, he says, from supporting it and holding up Erdogan as an “Islamic example.” Being realistic, Maqdisi recognizes that his words are not capable of changing the opinion of the “polytheistic majority.” He calls for every single person to look inside himself and make the right choice in accordance with God’s law. People should not fear for Erdogan in his competition with less Islamic candidates, but should only fear for monotheism. As it would turn out, Maqdisi was not alone in reasoning. 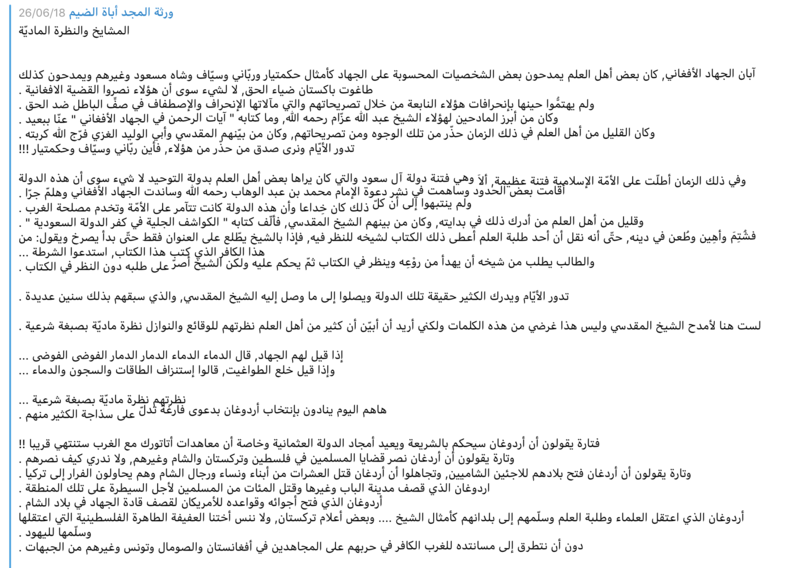 Fellow Jordanian Bilal Khuraysat (aka Abu Khadija al-Urduni), who is historically close to Maqdisi, weighed in with his own criticism of those celebrating Erdogan in two pieces released on 25 June. Khuraysat is a former security and sharia official in Jabhat al-Nusra who broke off from the group when it left al-Qaida. More recently, he has been rumored to be on the shura council of the new al-Qaida-affiliated Hurras al-Din. If Maqdisi was unwilling to attack Abu Qatada head on, Khuraysat displayed no such qualms. As reported by Cole Bunzel, Khuraysat claimed that “Abu Qatada no longer enjoys the scholarly cachet and prestige he used to in the jihadi current.” This is a serious, though arguably true, accusation against a senior Jihadi scholar—and fellow Jordanian at that. In his second piece, this time without mentioning the name of Abu Qatada, Khuraysat criticized the compromise between secularism and Islam that some people are seeking, thus touching on the same theme as Maqdisi. The barrage against Abu Qatada’s position did not stop there. 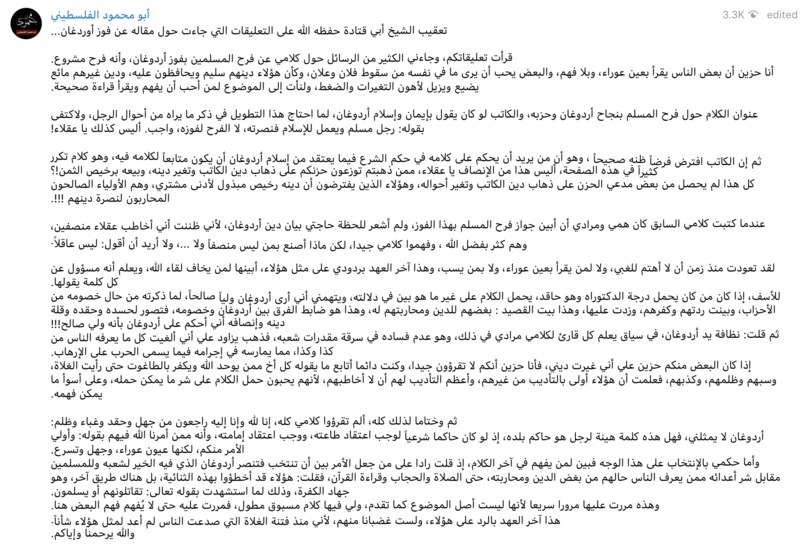 An unnamed Maqdisi supporter provided a two-part critique (see here and here) of sheikhs who do not understand monotheism and its boundaries. According to the author, history is full of examples of noteworthy figures that fought for Islam but at the same time contravened tawhid by supporting un-Islamic regimes. Supporting Erdogan is no different, he says. This is “the Erdogan who bombed the city of al-Bab and others and killed hundreds of Muslims in order to seize control of that region. The Erdogan who opened his airspace and bases to the Americans to bomb the leaders of jihad in the Levant. The Erdogan who arrested scholars and students of religion and handed them over to their home countries.” Instead of listening to these sheikhs who dilute Islam, one should listen to Maqdisi, who since the days of the Afghan jihad has been a stalwart upholder of a pure monotheism. Another al-Qaida supporter, “Salah al-Deen,” offered a similar take. More direct support for Abu Qatada came from Abu Mahmoud al-Filastini, a student of Abu Qatada’s based in London who has also been at odds with Maqdisi over the past year (see his article titled “Maqdisi and the free fall”.) Abu Mahmoud’s first response was delivered in the form of advice to Bilal Khuraysat, whom Abu Mahmoud claims is reading Abu Qatada’s statement out of context. Abu Mahmoud emphasizes that his mentor explicitly stated that Erdogan does not represent him. 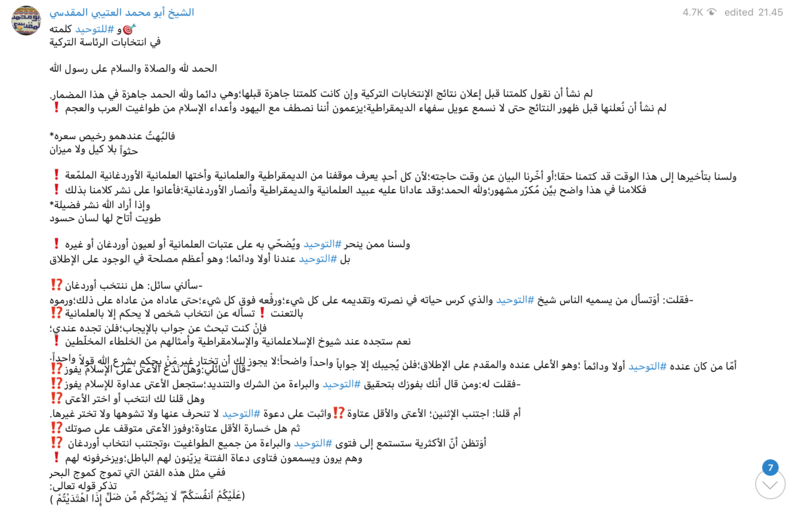 His second comment centers on a constant issue in the Jihadi movement: how creed (‘aqida) is properly translated into action (manhaj). Maqdisi and his followers are known for their extreme puritanical methodology, allowing little room for pragmatism. For Abu Mahmoud and Abu Qatada, it does not make sense to make an enemy out of Erdogan despite the fact that they do not necessarily consider him a good Muslim ruler. Just look at the Taliban and its relationship to Pakistan, Abu Mahmoud says. Perhaps trying to provoke controversy, Abu Mahmoud says that the strategy of making enemies everywhere most of all resembles how the Islamic State behaved. Soon after, an article in a pro-Islamic State newsletter, ‘From Dabiq to Rome,’ also commented on the issue. Although the article does not name any of the above figures, it should be read as a critique of Abu Qatada’s position and his celebration of Erdogan’s victory. The article refers to a fatwa by the late Saudi Jihadi-Salafi sheikh Hamud ibn ‘Uqla al-Shu‘aybi, in which he says that “congratulating the kuffar and sending them blessings upon their taking office ​is something prohibited by the sharia.” Though al-Shu’aybi’s fatwa was issued in the context of congratulating Vladimir Putin, according to the newsletter it is no less applicable to Erdogan, who long ago abandoned Islam by supporting a secular system and directly waging war against the people of Islam. Indeed, whoever congratulates Erdogan on his victory is as much an apostate as Erdogan himself. The logic here is not controversial within Salafi circles, based as it is on the third nullifier of Islam mentioned by Muhammad ibn ‘Abd al-Wahhab. But the unsubtle implication in this case is that scholars like Abu Qatada and Muhaysini are to be considered apostates. This was already the Islamic State’s position, so no news there. But the Islamic State’s argument is noteworthy in that it illustrates the divisive potential of the Erdogan issue. Though they may pretend otherwise, it is clearly a serious bone of contention between Maqdisi and Abu Qatada, and between different sides of the pro-al-Qaida wing of the Jihadi movement more generally. It is unlikely that we have heard the end of it.